Discovered in 1852 by Italian astronomer Annibale de Gasparis, Psyche is one of the ten most-massive asteroids in the asteroid belt. Although Psyche is thought to be a world made of metal, scientists have recently found the presence of water on this minor planet. The new findings which baffled researchers, could be confirmed and further studied by a newly announced NASA mission to this small solar system body. Psyche is an irregularly-shaped M-type asteroid with a diameter of about 124 miles (200 kilometers). Several studies conducted over the last decade suggest that this celestial body is dominantly composed of metal, having a metal-rich surface. However, a recent research carried out by a team of scientists led by Driss Takir of the U.S. Geological Survey (USGS) adds a mystery to our understanding of this small rocky world. The researchers observed Psyche with the SpeX spectrograph at the NASA Infrared Telescope Facility (IRTF) in Hawaii, searching for evidence of hydration on the asteroid. They found that Psyche’s spectra exhibit a 3-micron absorption features, possibly due to water or hydroxyl. The new findings suggest that Psyche might not have a metallic core and could be a water-rich asteroid. Therefore, the most perplexing question is the origin of water on this rocky world and Takir’s team offers few plausible explanations of this phenomenon. “It is possible that water-rich minerals detected on Psyche might have been delivered to its surface by carbonaceous asteroids that impacted Psyche in the distant past. We also think that Psyche, and some other M-type asteroids, may not be entirely exposed metallic core. What we see might instead have been a core-mantle boundary of a differentiated body that was disrupted via impacts. Solar wind could be another mechanism that can produce hydroxyl by interacting with the surface of Psyche and some other M-type asteroids,” Takir told Astrowatch.net. Although IRTF is one of the most optimized and suitable telescopes for detecting water and hydroxyl on the surface of asteroids, it could never replace a scientific probe examining its target in situ. That is why sending a dedicated spacecraft equipped in a set of specialized instruments would allow the scientists to better characterize hydration on the surface of Psyche and solve the mystery of origin of water. Such a dedicated mission to Psyche is in its early stages of development as NASA has announced on Jan. 4 that it will send a probe to this asteroid under the agency’s Discovery Program. The “Psyche” spacecraft is planned to be launched in 2023 and expected to arrive at its destination in 2030. The mission would spent 20 months in orbit around the asteroid, mapping it and studying its properties. While the spacecraft’s primary goals will be to determine whether Psyche really is a protoplanetary core, how old it is and what its surface is like, it could be used to confirm the findings presented by Takir’s team and unveil the mechanism behind the hydration of this minor planet. In order to perform its scientific studies, few instruments has been proposed that would be carried onboard the orbiter. It could be equipped in a multispectral imager capable of acquiring high-resolution images using filters to discriminate between the asteroid’s metallic and silicate constituents. Another tool would be a gamma-ray and neutron spectrometer that will detect, measure, and map Psyche's elemental composition. Moreover, the probe could be also fitted with a magnetometer designed to detect and measure the remanent magnetic field of the asteroid. 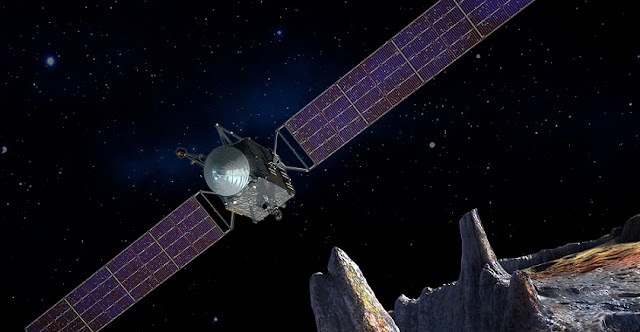 Meanwhile, until the newly announced spacecraft reaches Psyche, Takir’s research team will focus on studying water-rich asteroids using ground-based instruments and their own techniques of observations. “We will continue studying Psyche, and other water-rich asteroids, to give us further insight into the formation and evolution of the solar system. Although detecting water is very challenging using ground-based telescopes, we developed some observing tools and data reduction techniques that allow us to characterize the shape of the 3-micron absorption hydration band in asteroids,” Takir concluded.